View of a ruined single-span bridge over a waterfall with a series of buttressed walls with vegetation to one side. You are here: CollectionsOnline / View of a ruined single-span bridge over a waterfall with a series of buttressed walls with vegetation to one side. 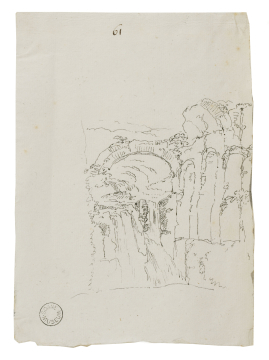 The subject may be one of the mountain bridges around Vespasian's tunnel, Italy, which Robert Adam drew with Charles-Louis Clérisseau (1721-1820) during their Rimini tour of 1755, see Clerk Collection, Scotland, Clerk 137 and 139 (see J. Fleming, Robert Adam and His Circle in Edinburgh & Rome, London, 1862, p.182). The rather spidery draughtsmanship of this drawing may be compared with a similar study in the landscape section of Adam volume 54/Series 5/18.